Can you join our Social Media Thunderclap to announce the Shortlist for Twisted50 volume 2? You can join it HERE and will take just 30 seconds. Once announced we will be selecting the finalists and judging them for the Awards. Right now we are also working on the concept that we will bring Twisted50 volume three out of the shortlist. This is a reflection of the excellent work submitted. 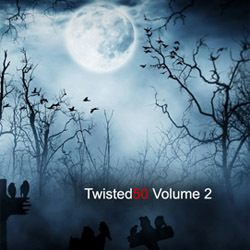 Twisted50 Volume 2 brings 50 new terrifying voices in horror to a bookstore near you. Forged out the Create50 process, and following up the hugely successful Twisted50 volume 1, you can bet this second volume will push deeper into our collective darkest of fears. PS – The Singularity50 shortlist announcement is about six to eight weeks away. Fingers crossed.